Welcome to the “21 Days of Recipes“! I’ll be sharing a 21 Day Fix-friendly recipe each day for 21 consecutive days. Enjoy! Bacon. Cheddar. I don’t really need to say much more about this. Bacon. Cheddar. I don't really need to say much more about this. Preheat oven to 350. Spray rimmed baking sheet with nonstick spray. Mix half of the cheese with the Greek yogurt, cumin and salt. Fill each pepper with yogurt mixture. Reserve remaining mixture to use as dip. Add remaining cheese to top of each pepper. Wrap each pepper with turkey bacon and place on rimmed baking sheet. Secure with toothpick, if necessary. Broil on high for 1 - 2 minutes. Serve immediately with remaining dip and optional side of fresh vegetables. Is the 1 green 1.5 red and 1 blue per one popper? What brand bacon do you use? Mine is just not cooking up in the oven for some reason. Usually Applegate, but the one in this photo is Oscar. A-mazing!!! Thank you sooo much for all of your wonderful recipes!!! Yay!! So glad you like them, JulieAnn! Yay! So glad you liked it, Charisa! How are you liking the overall program so far? 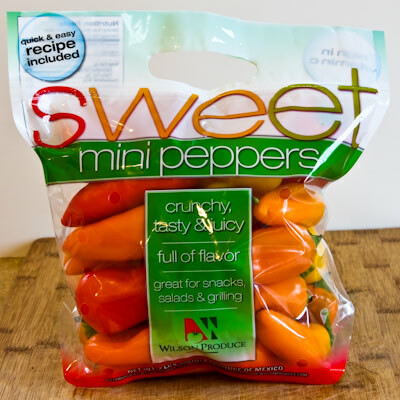 What exactly are sweet peppers? Bell Peppers? Jalapenos? Red or Yellow or Orange Bell Peppers? These look smaller than what I am thinking?? WOW! Day 5 of 21 fix and looking for something to do with abundance of jalapeño peppers…these knocked my socks off! Totally feel like a cheat meal. I substituted monterey jack because thats what I had on hand. My bacon was already cooked up for the week so I placed about 1/3rd slice of bacon on top of each one (rather than wrapping) prior to baking. Mixed in a touch of dinosaur bbq sauce (low cal) with remaining mixture for dipping for some smokiness. Can’t wait to make these for my husband…goodbye cream cheese! Sounds SO good, Liza!! Glad you like them! These were amazing! I will be making these again for sure. Even the hubs liked them and he is super picky. Oh, so awesome to hear!